Our vision is to help Banjo achieve all that he can and continue to amaze us everyday. Hello my name is Banjo and I am 5 years old. I was born 16 week premature at 24 weeks gestation and spent 140 days in the neonatal Intensive Care Unit. I had lots of ups and downs during this time and due to my extreme premature birth I now have dystonic Quadriplegic Cerebral Palsy. I can not sit, crawl, walk or use my hands so I need full assistance with all daily tasks. I am very clever and can understand everything you say to me and love it when you understand what I have to say. I have done lots of hours of therapy and made some wonderful gains with my head control, feeding and speech thanks to all my supporters cheering me on over the years. Its been such a busy 5 years but I keep smiling through it all. Last year I received stem cell therapy which we saw some amazing gains, especially in my speech and core control and allowed me to finally communicate my wants and needs to my family without getting so frustrated. I have now learnt to say many words quite clearly and I love telling people what I want to eat now and make choices for myself. My favourite food is cake. This year we are getting ready for my first year of school in January 2017 and I am very excited. I love to be around other children and interacting with them. I absolutely love the Teenage Mutant Ninja Turtles and my favourite character is Michelangelo the orange turtle which is why I now have an orange manual wheel chair. I am also hoping to get an electric wheel chair next year that I can drive using a head switch around the play ground at school. I can't wait until I am able to chase the kids in my chair and feel more involved with my peers. My orange wheel chair and electric chair are both far too heavy to lift in and out of our car and I have outgrown my old chair so we are now fundraising for a Wheel Chair Modified Vehicle which are very expensive. This will allow me to access the community and feel more involved with my peers at school. We hope to have a wheel chair modified vehicle by the end of the year so on my first day of school I can arrive in my orange wheel chair all ready for my first day of school. Email this link to you friends, family & colleagues and ask them to donate. All donations of $2 or more are tax deductible. The Developing Foundation commits 90% of funds raised by or donated to our team, to these unmet needs. The remaining 10% is used by the charity to cover credit card charges, administration and support. Thank you for your support, we really appreciate it. Have fun at school Banjo! You will love it. We hope it is not too long before you have your new chair friendly car. Good luck Banjo! Hope you get your new wheels soon. Hi Banjo, I'm sorry my donation is only of a small amount, i wish I could contribute more to help you. All the best at school! I hope it's everything you've dreamed of and more. Big love to you and your family. Enjoy school Banjo! You are gorgeous. 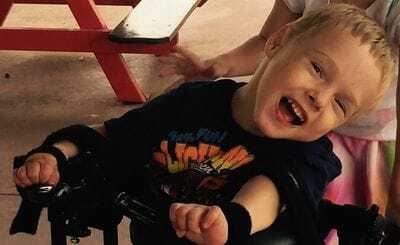 We hope this helps that amazing little boy of yours get his wheelchair. Banjo is lucky to have you as his parents. You're doing a wonderful job. Wishing you all the best with your fundraising for Banjos wheelchair car. We have been in the same situation and know how costly and important these cars are to a family with a child in a wheel chair. Lets get you to school Banjo.